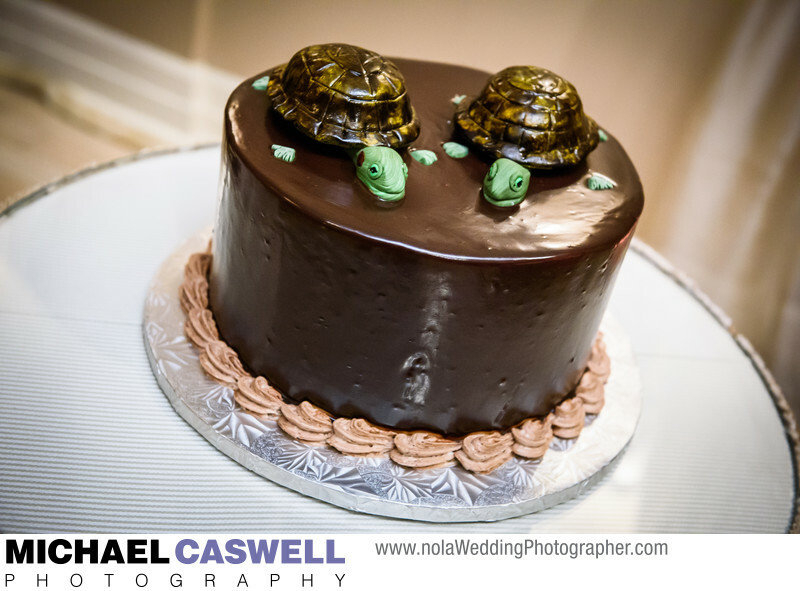 This page is not really about wedding photography specifically, but rather is just for informational and inspirational purposes, a fun collection of some of my favorite groom's cakes from the weddings I've photographed over the years. 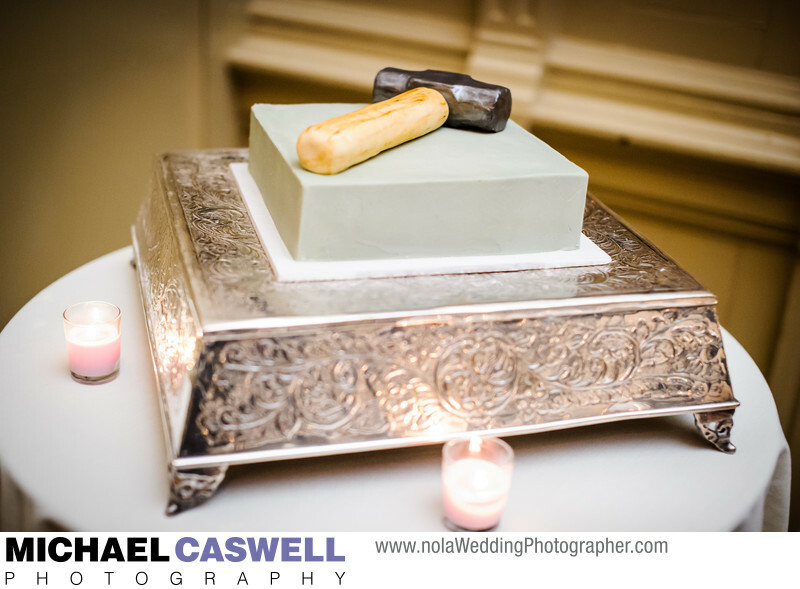 The groom's cake is another predominantly southern tradition that you'll encounter frequently at New Orleans weddings. 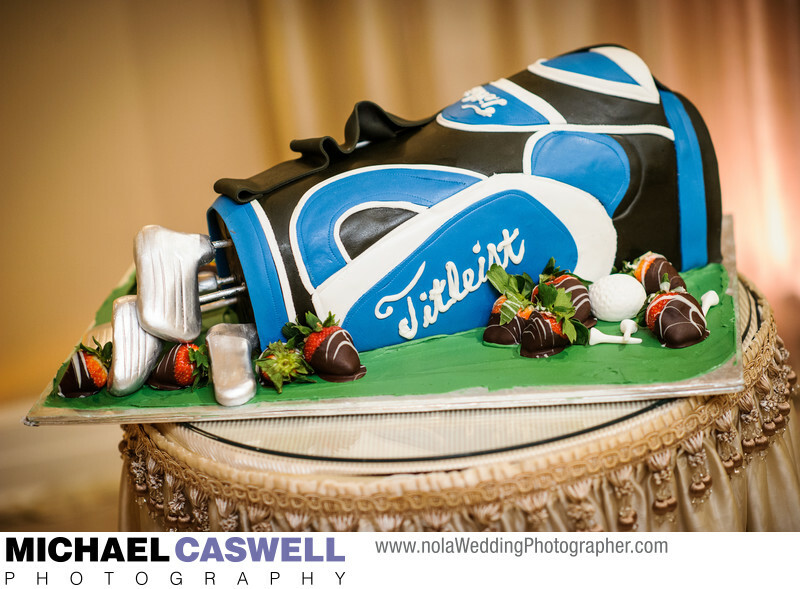 Groom's cakes are typically (but not always) located on a separate table near the main wedding cake, and is usually designed to reflect some significant aspect of his life, such as recreational interests, sports, the college he went to, favorite food, etc. 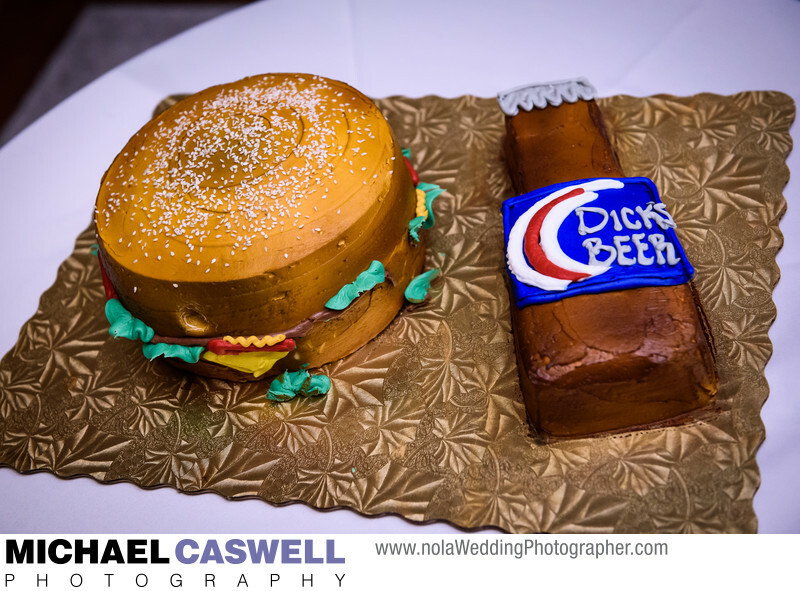 While the traditional main wedding cake will usually tend to be elegant and dignified in its appearance, groom's cakes are, more often than not, a bit more lighthearted, and sometimes downright comical, a chance for the couple to cut loose a bit! Many are truly works of art that are painful to watch them get sliced up during the reception. 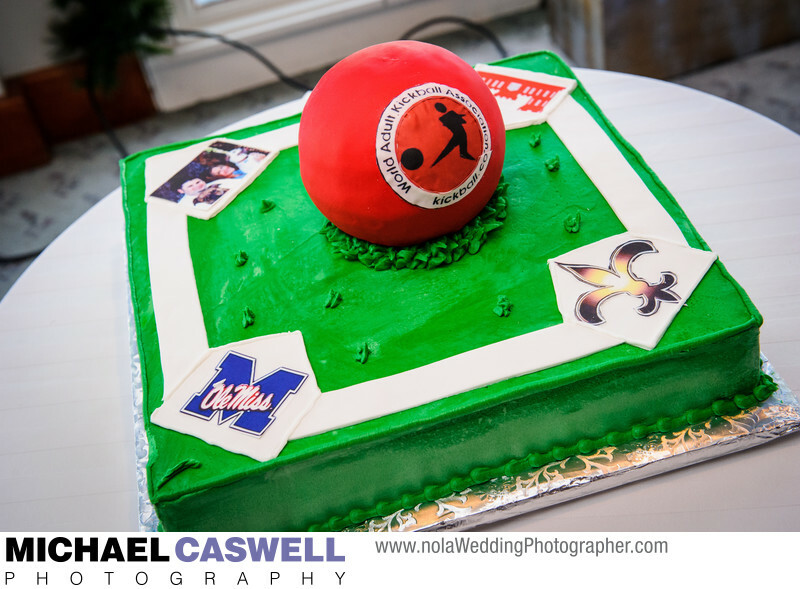 Sports themed grooms cakes are probably the most popular, and for good reason, as most guys love their sports! 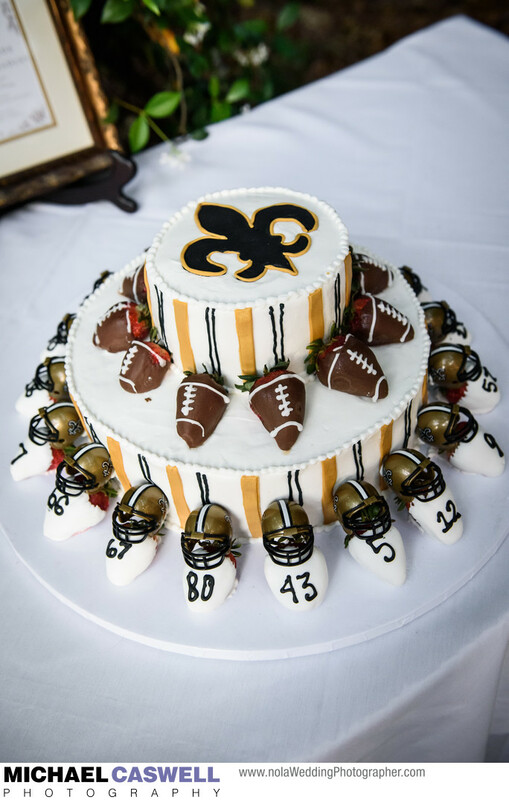 Cakes can show support for the groom's favorite professional team, such as this adorable Saints-themed cake from a wedding at Vintage Court in Covington, created by baker Kristen Payne. 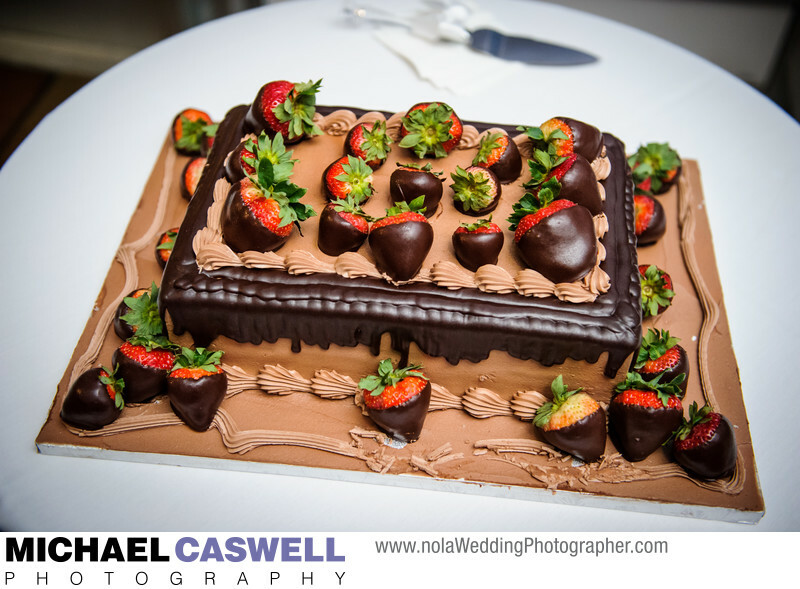 This cake incorporated chocolate covered strawberries, as the couple always enjoyed making these treats when they were dating. 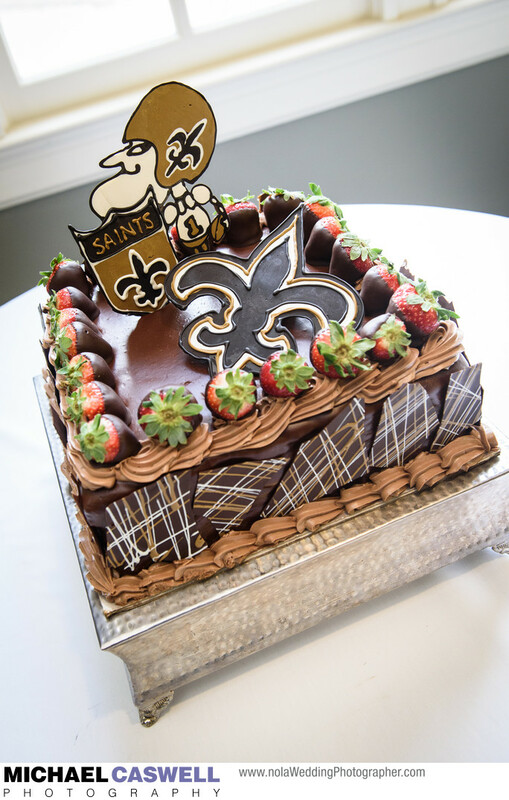 Another Saints cake, this one by Zoe's Bakery Southern Hotel in Covington, for a lifelong Saints fan who moved out to California, but still maintained his allegiance to his hometown team! 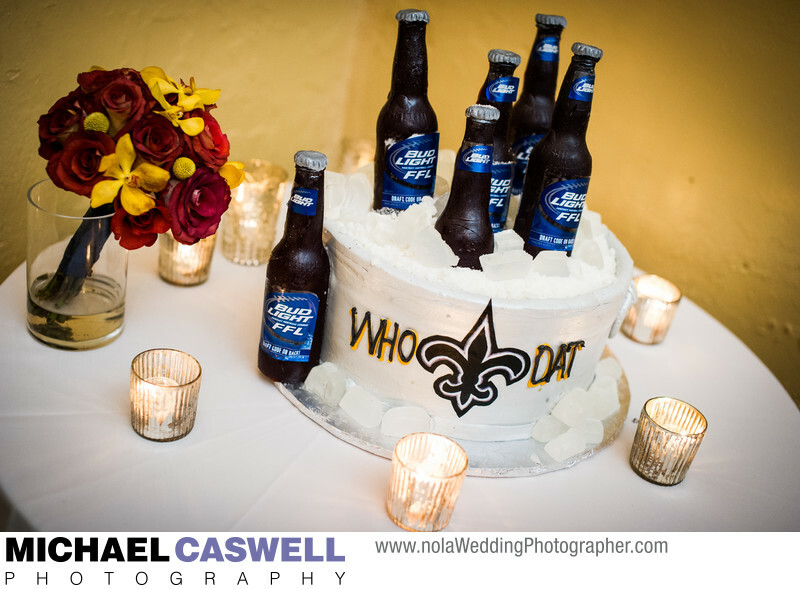 Who Dat and Bud Light at Latrobe's on Royal, courtesy of Royal Cakery in New Orleans. 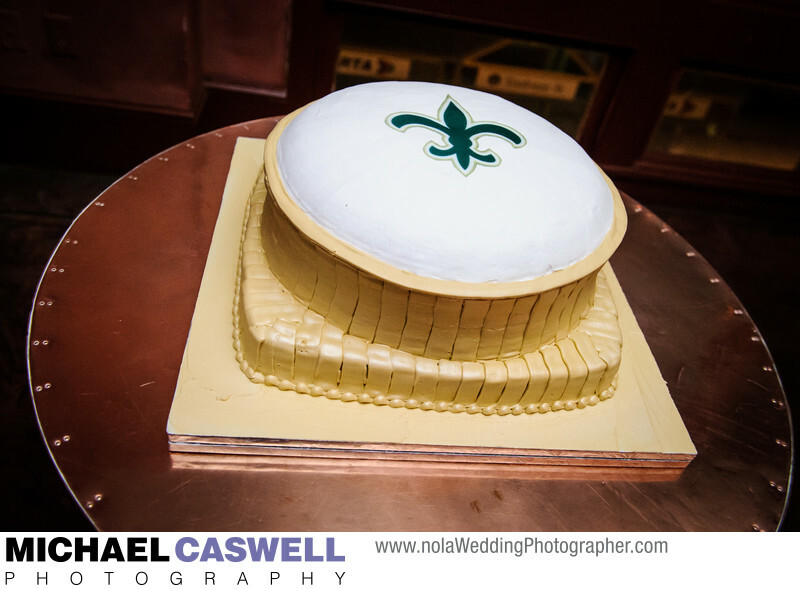 Of course, just because your wedding is in New Orleans, that doesn't mean you can't show your pride in other teams. 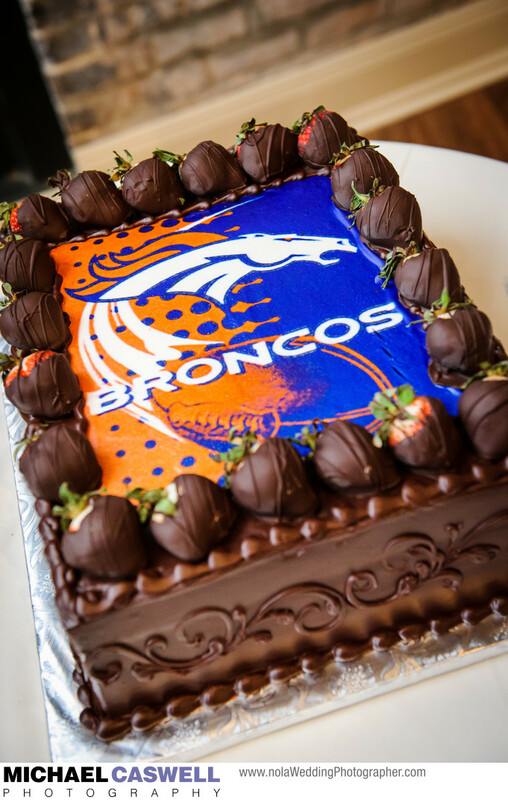 Here's a Denver Broncos fan's cake. 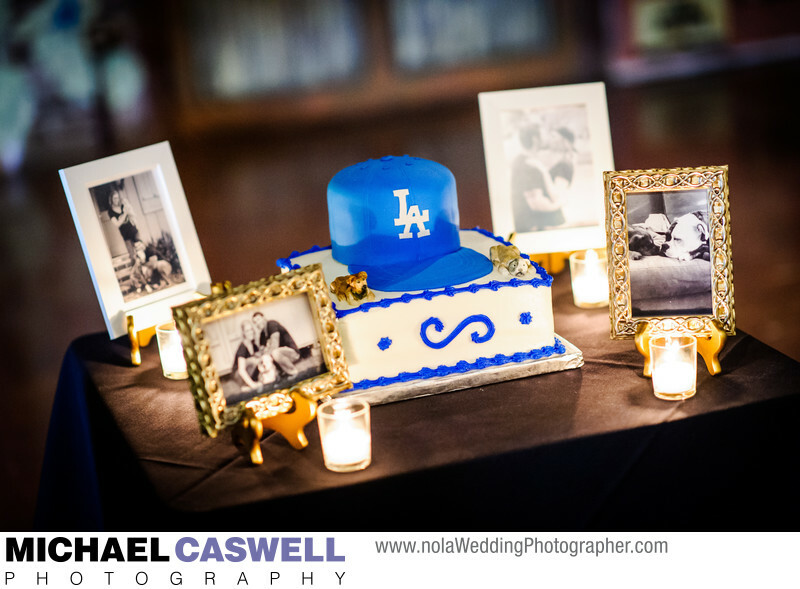 And a Los Angeles Dodgers cake, surrounded by some photos of the couple and their pet dogs. 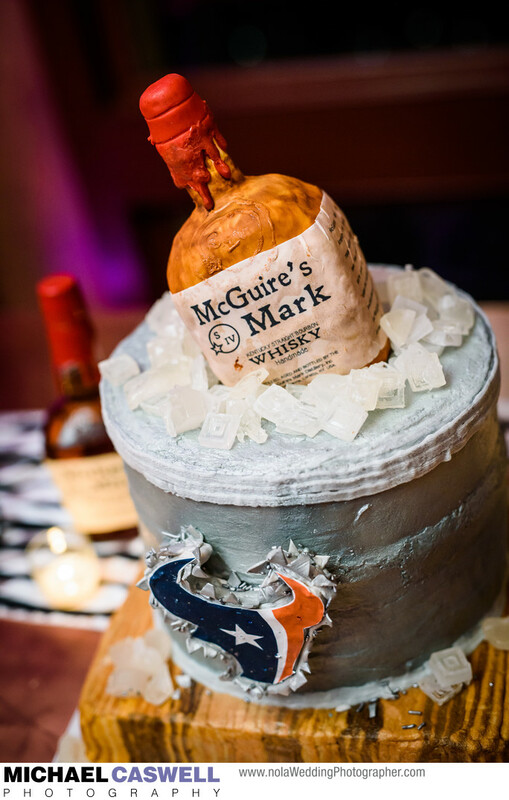 This Houston Texans cake featured a bottle of whiskey that, at first glance, appears to be Maker's Mark. But upon closer inspection, it actually says McGuire's (the groom's last name)! 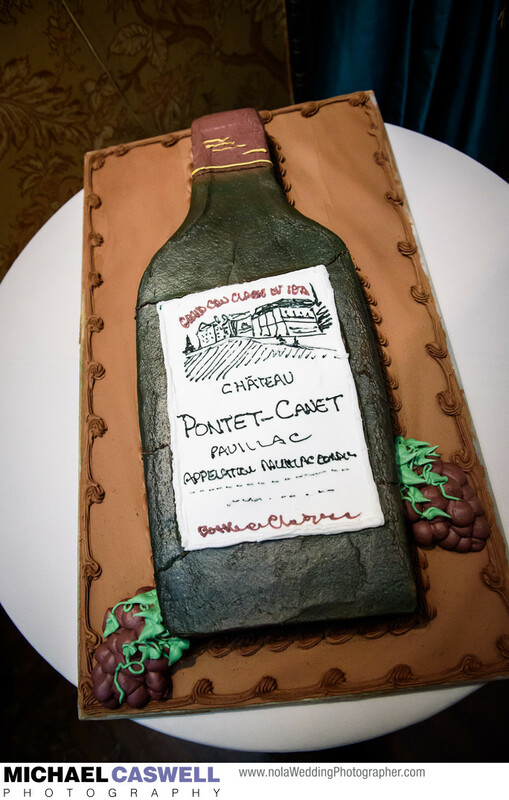 What was extra special about this cake was that it was crafted by a particularly talented family member. College teams are well represented too, like this Ole' Miss Rebels football field at Hotel Mazarin. 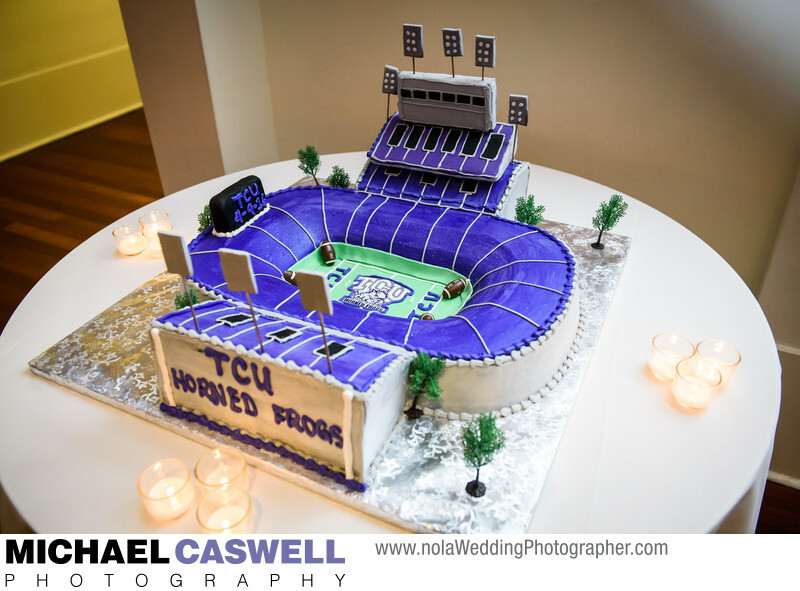 Here's a spectacularly rendered representation of the stadium of the Texas Christian University Horned Frogs for a wedding at the Audubon Tea Room. Sometimes a groom's allegiances can be divided among his favorite college and pro teams. 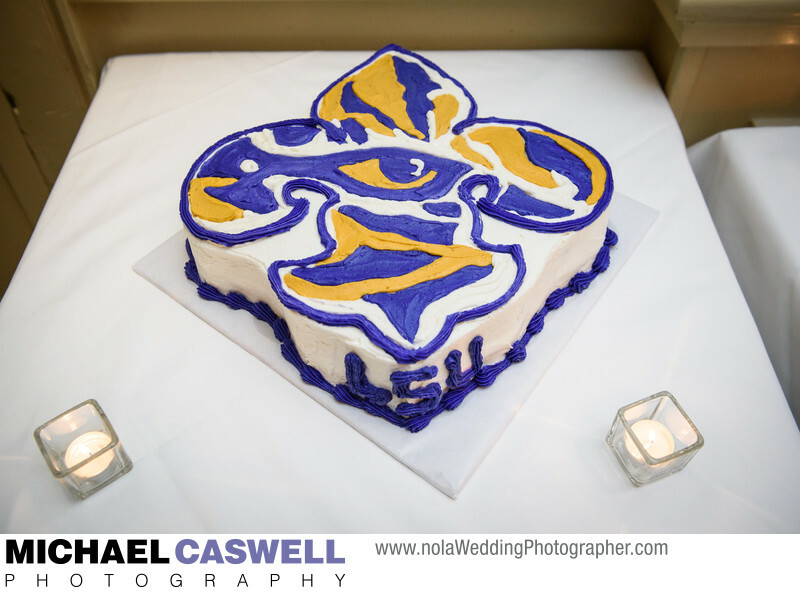 Of course, combination Saints and LSU cakes are a common sight. 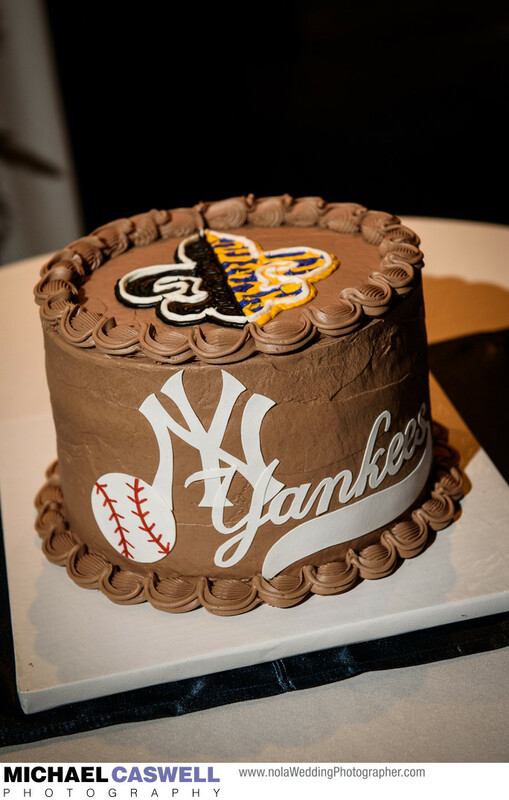 Or how about the New Orleans Saints, LSU, and the New York Yankees all on one mashup cake! 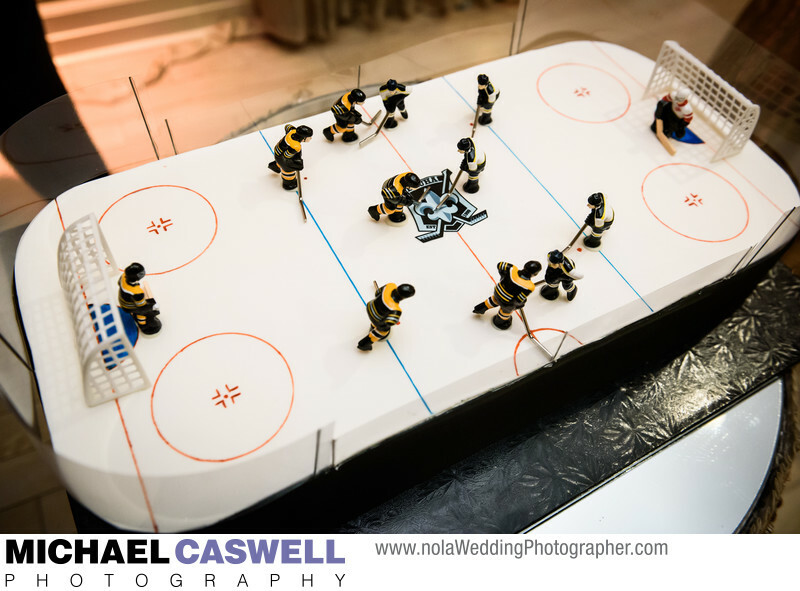 Sometimes the sport represented is one that the groom himself actually participates in, such as this cake at Southern Oaks Plantation of a hockey rink, as the groom plays in this Baton Rouge league. And kickball, with the Saints and Ole Miss also included as "bases" on the field. Here we have a beautifully rendered bag of golf clubs. This groom is an avid Crossfit athlete. He met some of his closest friends through the sport and thinks of it as his favorite hobby and means of staying fit. After he and the bride started dating, working out became one of their favorite things to do together. 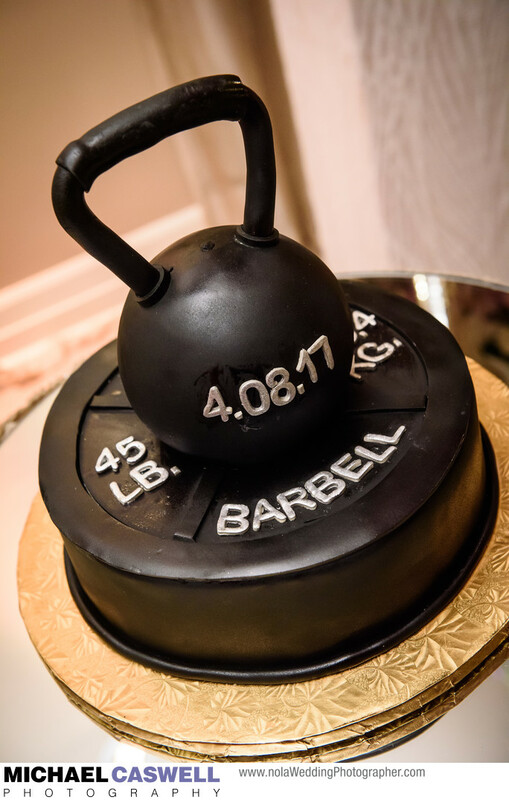 The barbell plate and the kettlebell are two of the more common pieces of equipment used in Crossfit; showcasing them and additionally adding their wedding date made the cake personal. 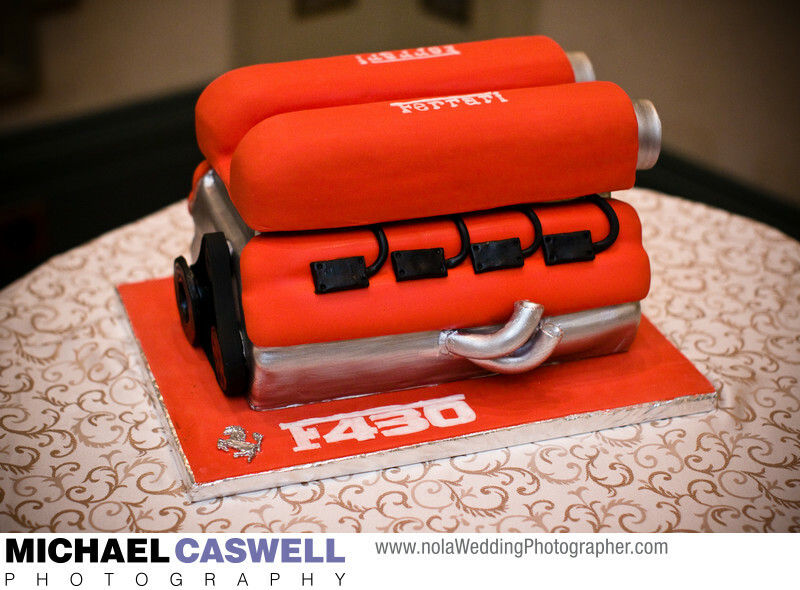 Sometimes the groom's occupation is used as the theme for the cake. 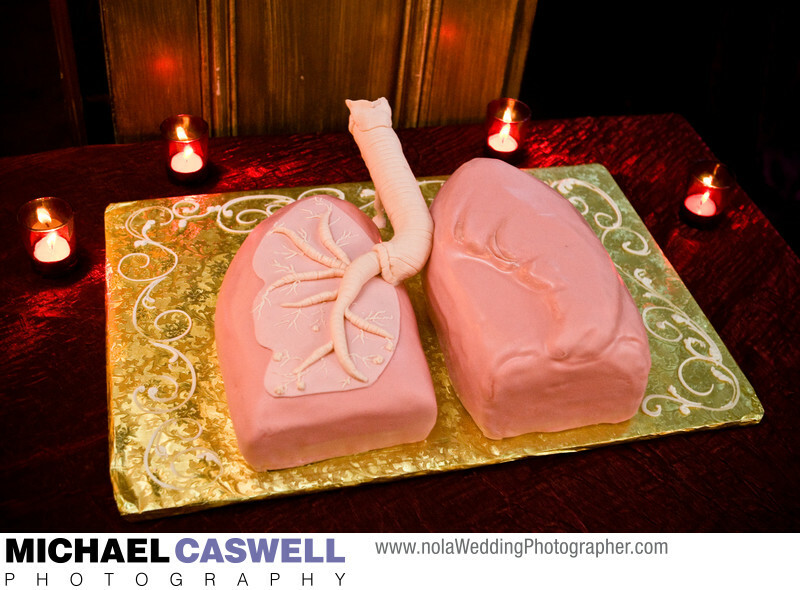 Here's the cake for a physician who specialized in the field of pulmonology... yes, a set of human lungs! So, of course, there were plenty of "surgery" jokes later in the reception when he wielded a knife to cut the cake, which, yes, was red velvet. 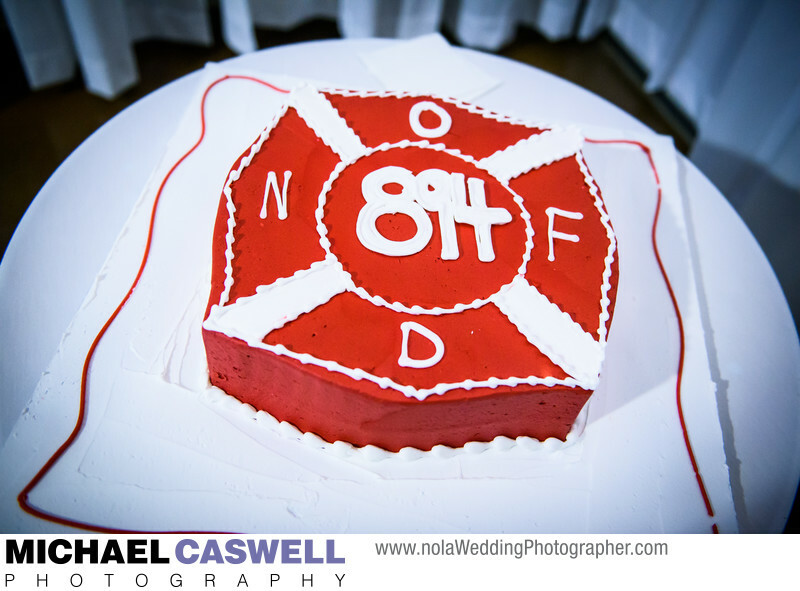 The insignia of this groom's fire department was featured on this cake at the Arbor Room in New Orleans City Park. 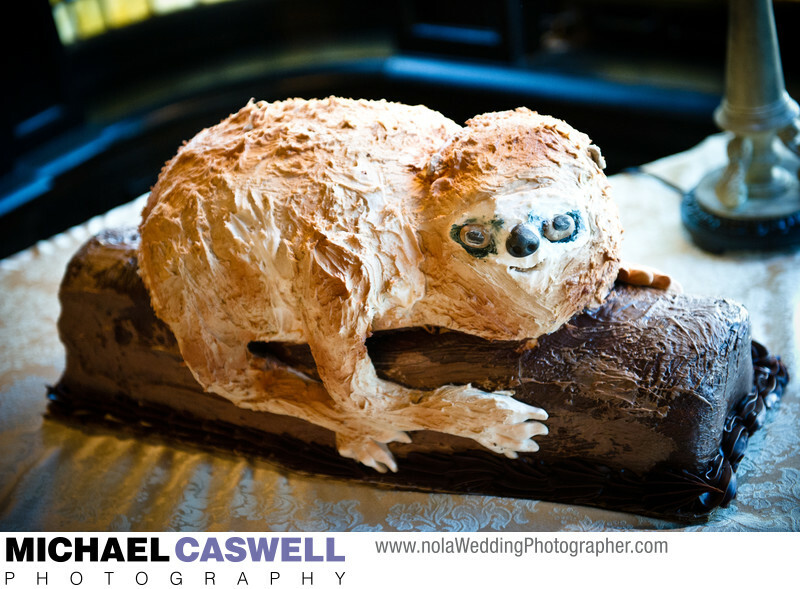 If you happen to be in the rare animals business, a Sloth is a perfect choice! 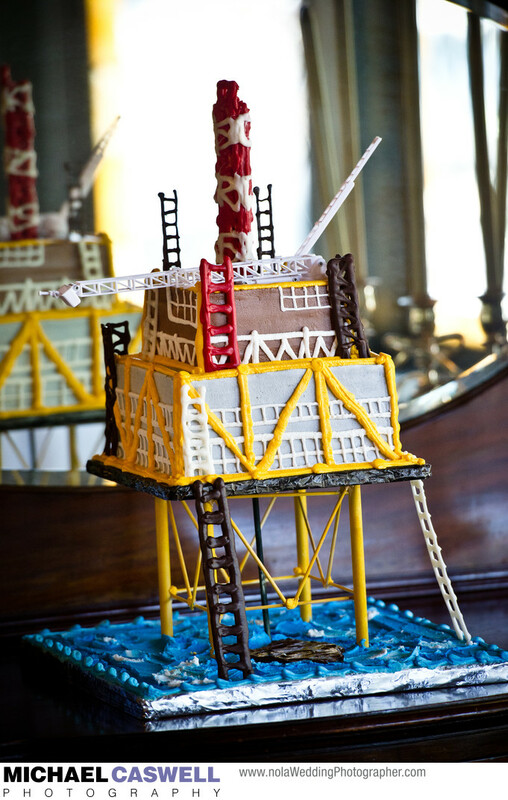 Or how about a spectacularly detailed offshore oil drilling rig for a petroleum engineer? Or a hammer for someone in the construction industry? This groom is a sports writer and covers LSU sports and recruiting. He and the bride met when they were both working for a recruiting website. 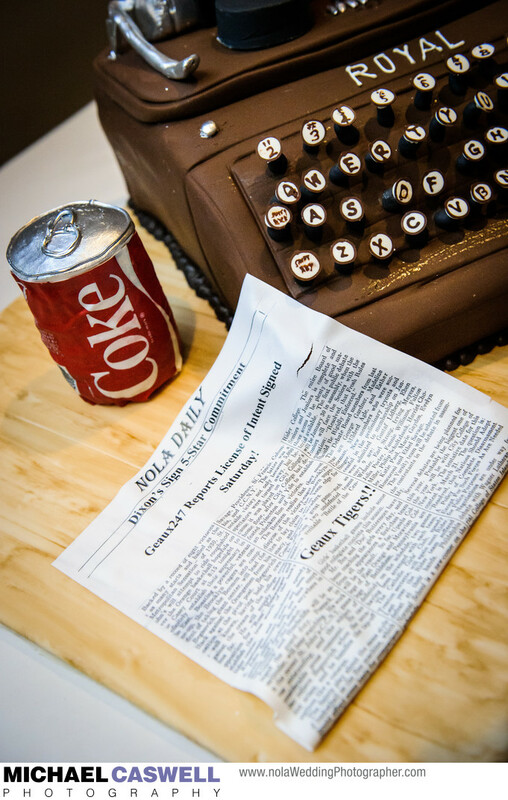 The bride knew a typewriter would be a perfect cake for him, because he also collects old typewriters. The bride's mom added the Coke can, since he is obsessed with Coca-Cola, and the newspaper with the recruiting headline (a 5-star is the highest ranking you can get as a recruit, so that's why they went with the title). 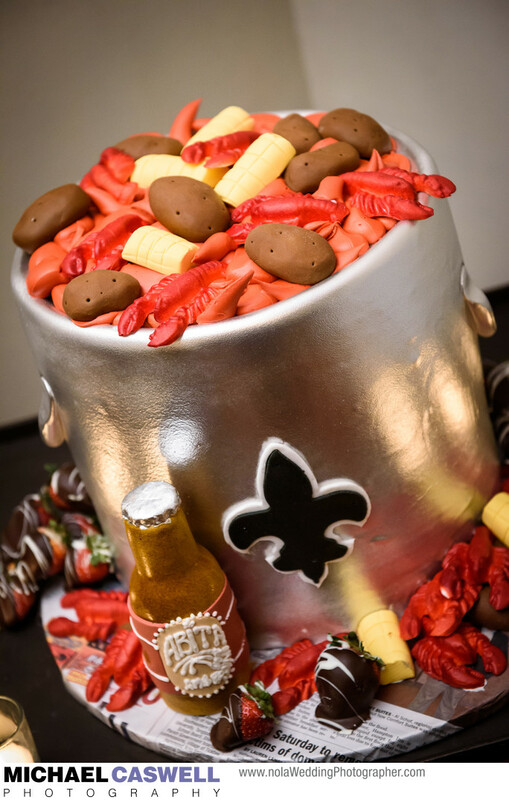 Being that this is New Orleans, foods and alcoholic beverages are another common theme. This cake features both! 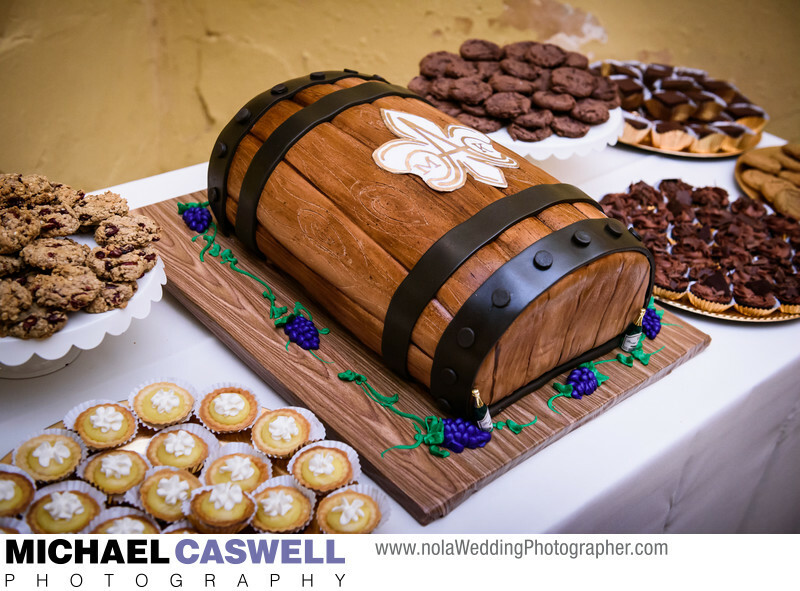 This groom is in the wine business, so his cake was gorgeous Royal Cakery sculpture of a wine cask at Latrobe's.. 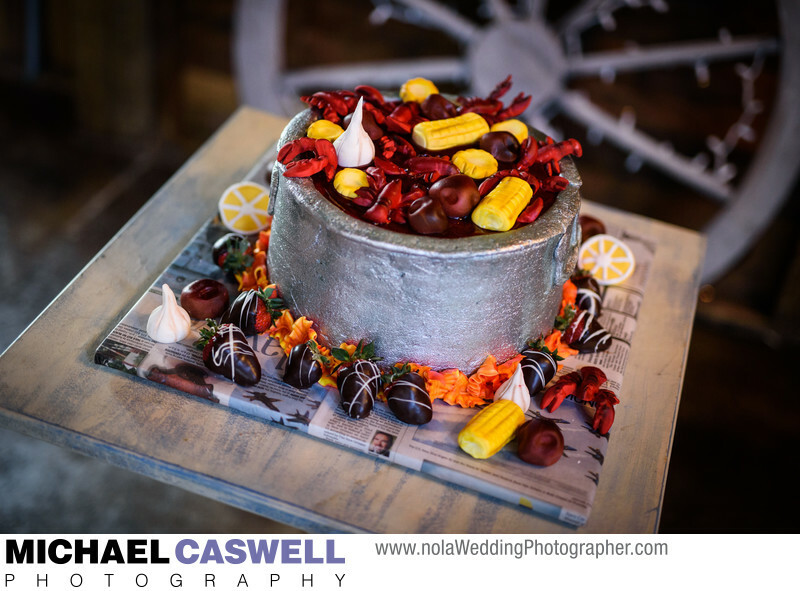 The crawfish boiling in a pot cake is very popular, this one at the Barn of Pearl River. Here's one with the added bonus of a bottle of Abita beer. 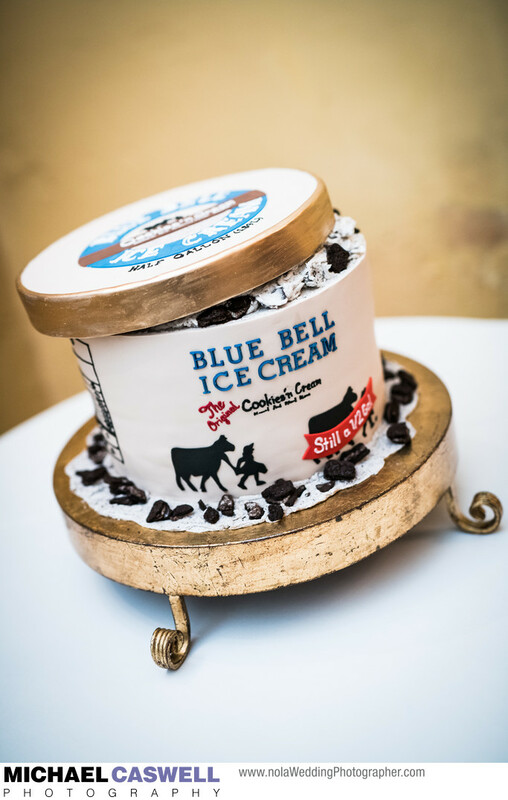 This groom loves Blue Bell ice cream (especially cookies & cream), represented with this beautiful La Louisiane Bakery creation. 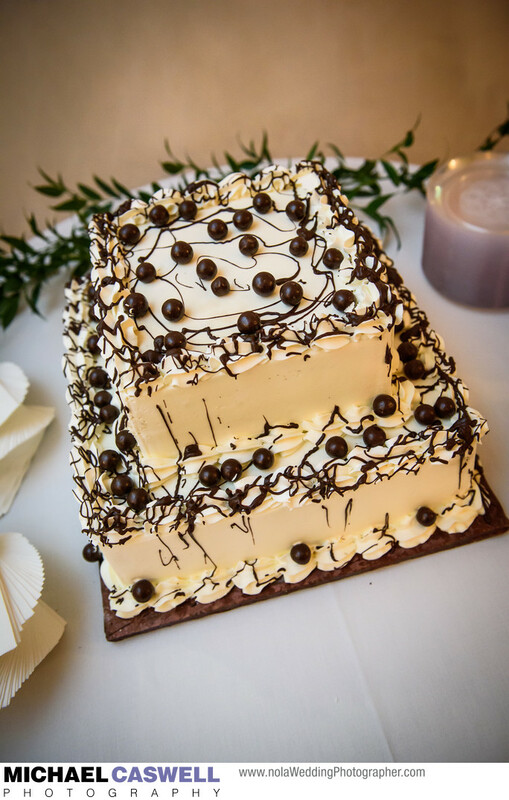 Sometimes, the concept and design of the groom's cake is kept secret from him, so he has no idea what to expect (or might not even know about it at all), as was the case with this wedding at Latrobe's. 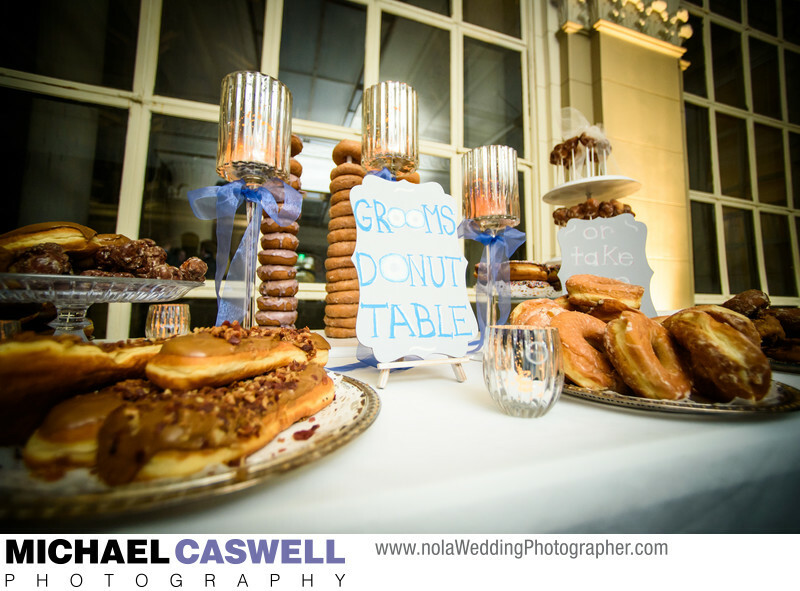 When the groom loves donuts, instead of a groom's cake you get a groom's donut table! 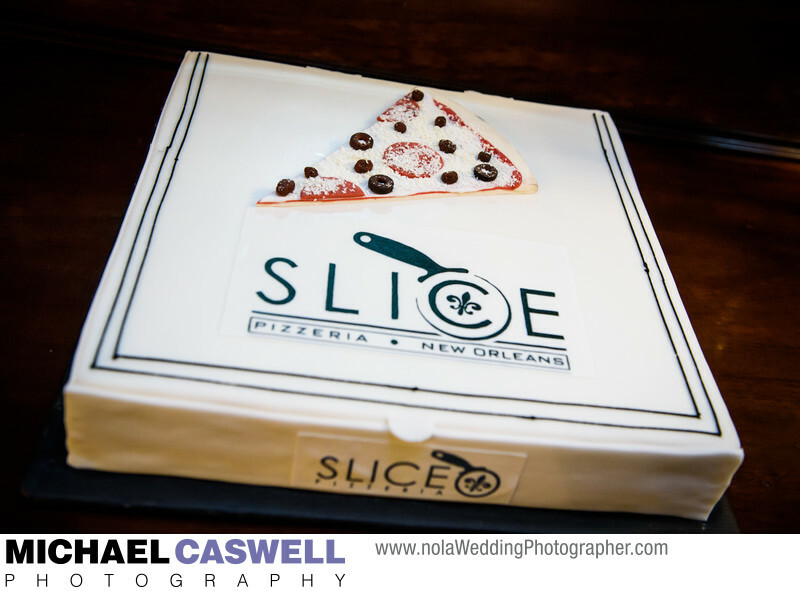 This wedding took place at the Federal Ballroom in downtown New Orleans. 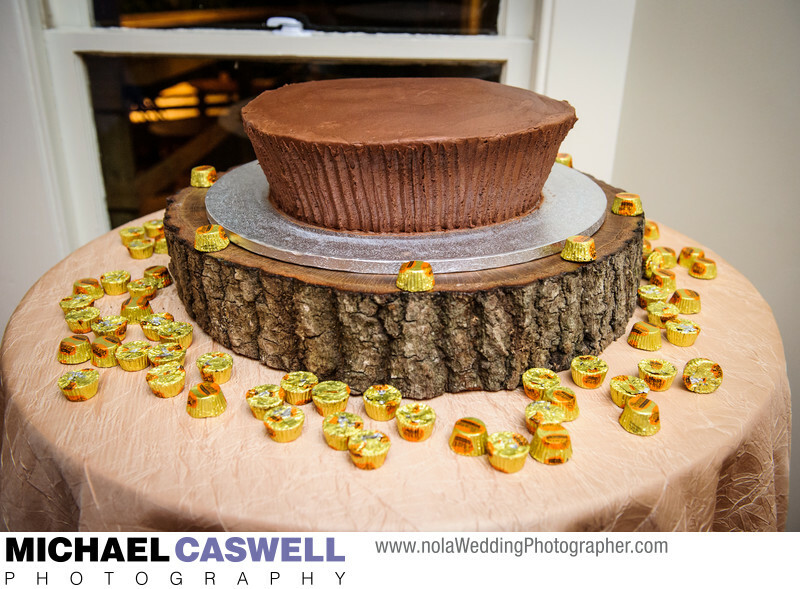 And when he loves Reese's Peanut Butter Cups, you have Creme de la Crème Custom Cakes create a HUGE one. 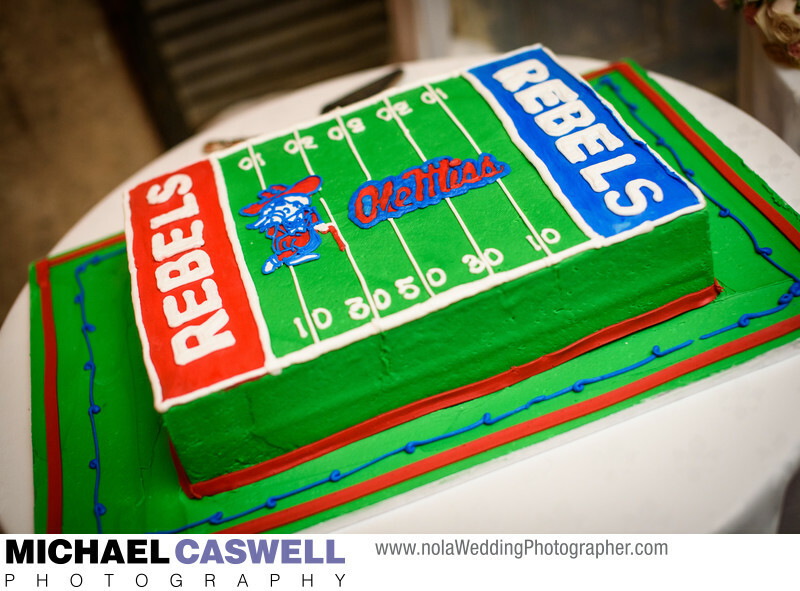 The cake can be an opportunity for the groom to show pride in his home state. 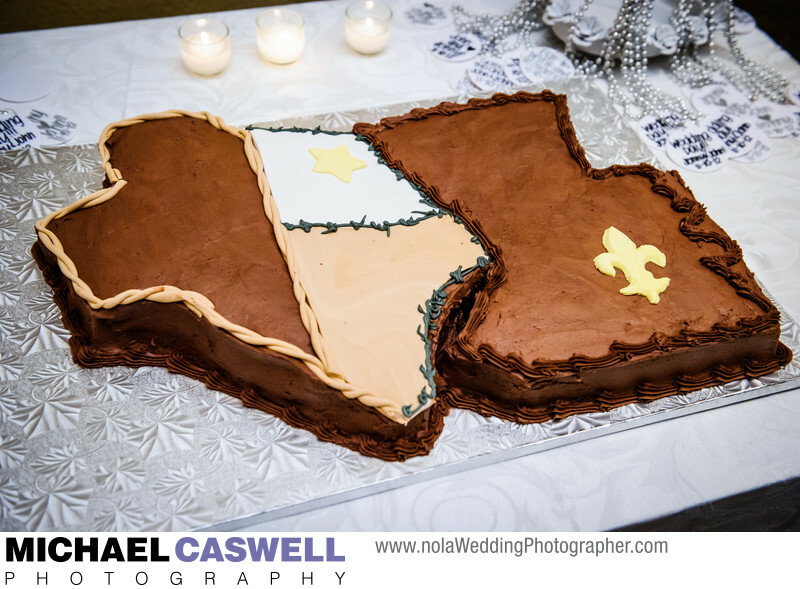 Or it can represent where both the bride and groom came from... Louisiana and Texas in this case. 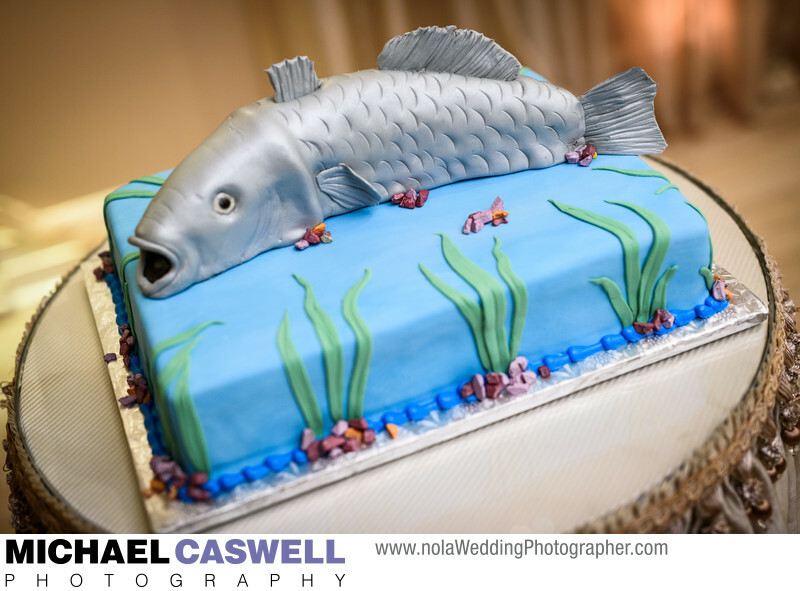 The groom's cake doesn't necessarily have a super-creative theme or outrageous design... it can simply be his favorite kind of cake. 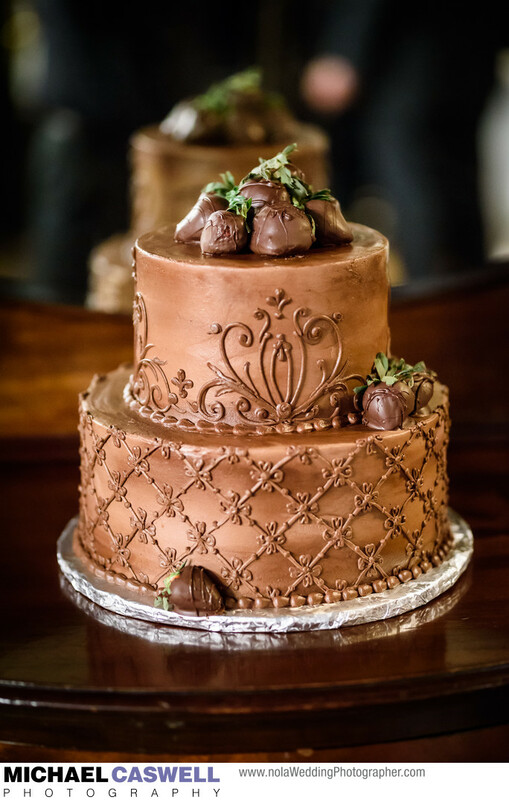 Another benefit of groom's cakes is that they give your guests an alternate flavor (often chocolate) to choose from. The inclusion of strawberries is a popular option. 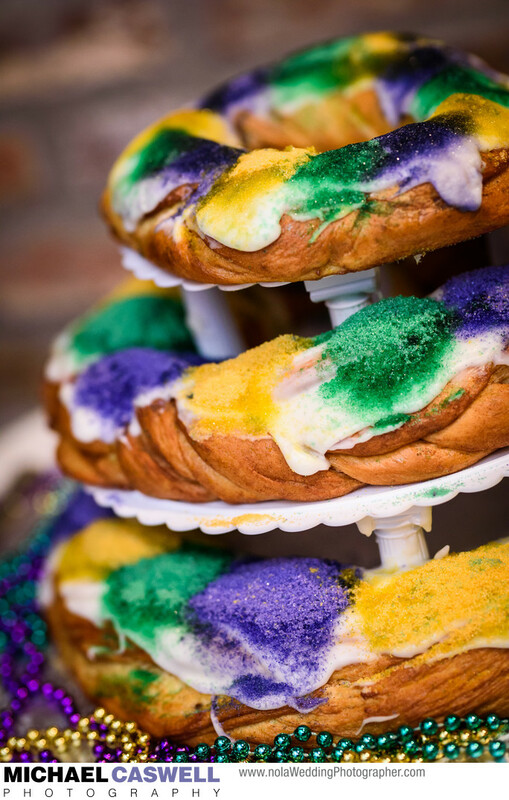 And of course, king cakes! 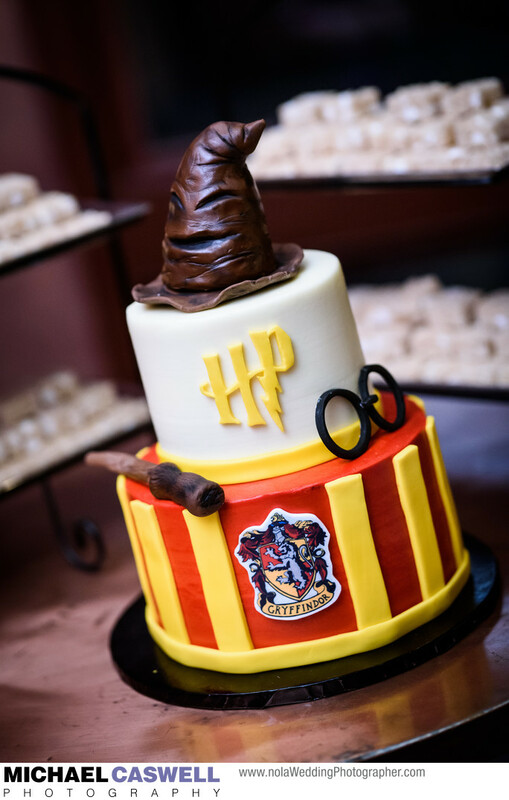 I've seen a few Harry Potter themed cakes, but this one is my favorite, topped with the Sorting Hat! 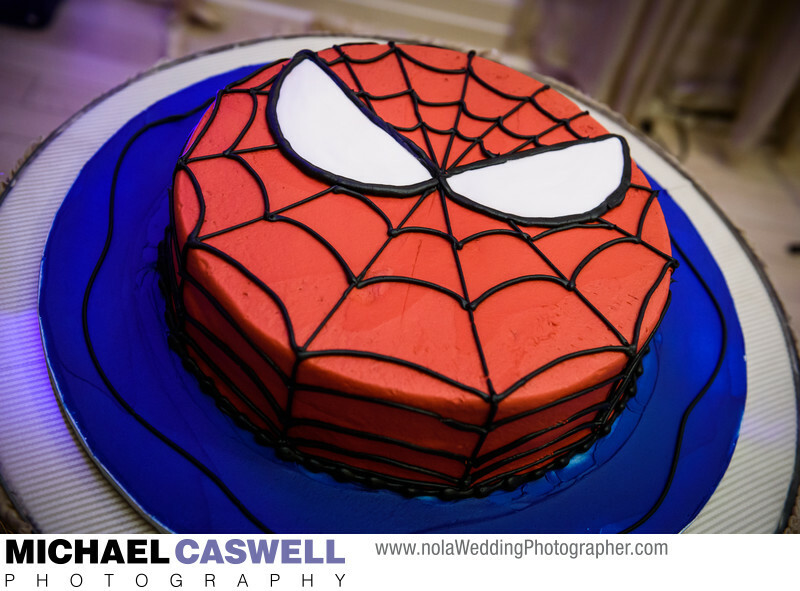 A simple, but graphically striking and impressive Spiderman cake. 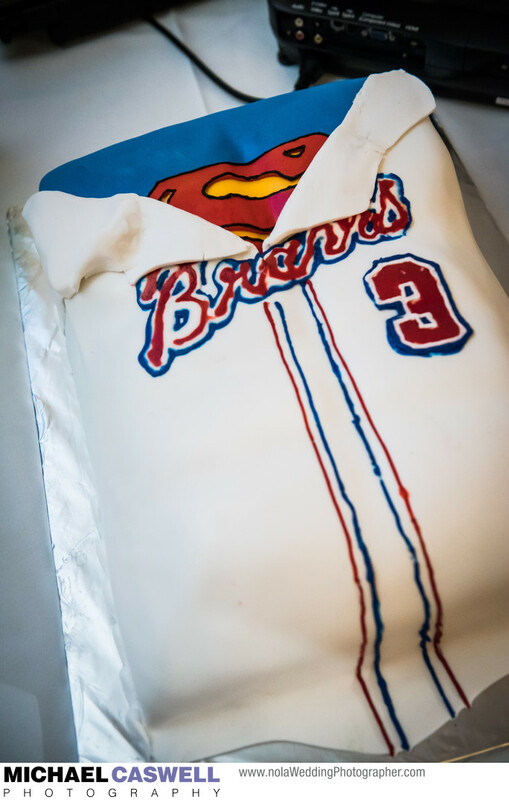 Perhaps this one belongs in the Sports category, but a combination Atlanta Braves / Superman tribute to Sean Rodriguez. 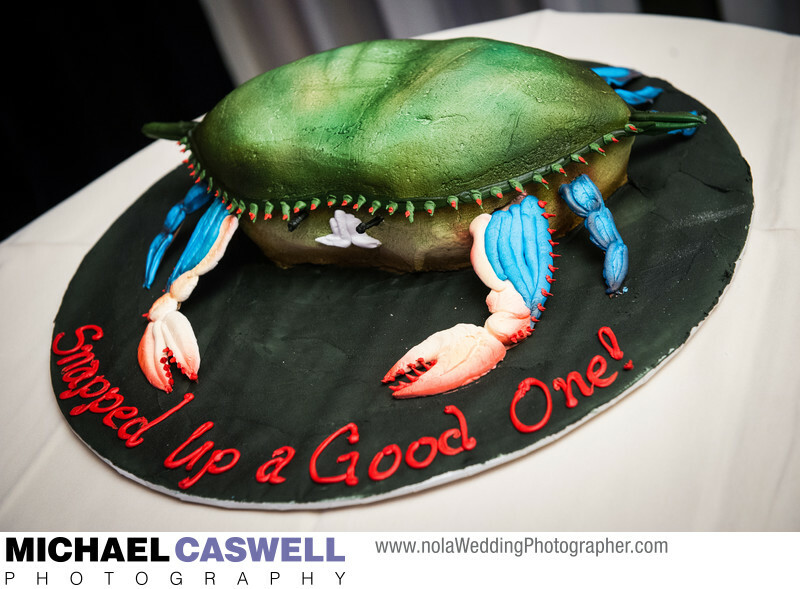 Sometimes the theme is more subtly stated, requiring a degree of knowledge about the film, such as this cake from a wedding at Compass Point Events in Algiers. 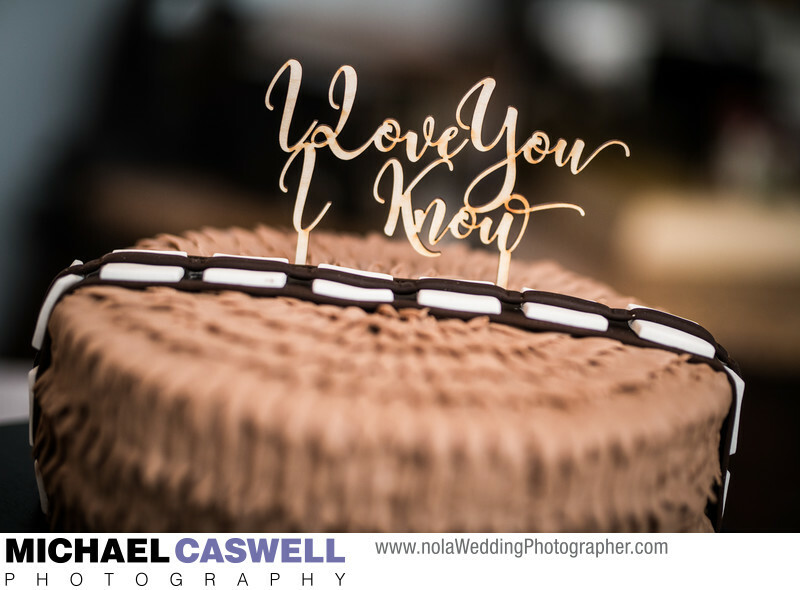 Star Wars fans will instantly recognize Chewbacca's belt, as well as the icing that resembles his fur, along with the well-known lines of dialog from The Empire Strikes Back where Princess Leia tells Han Solo, "I love you," to which he famously replies "I know." 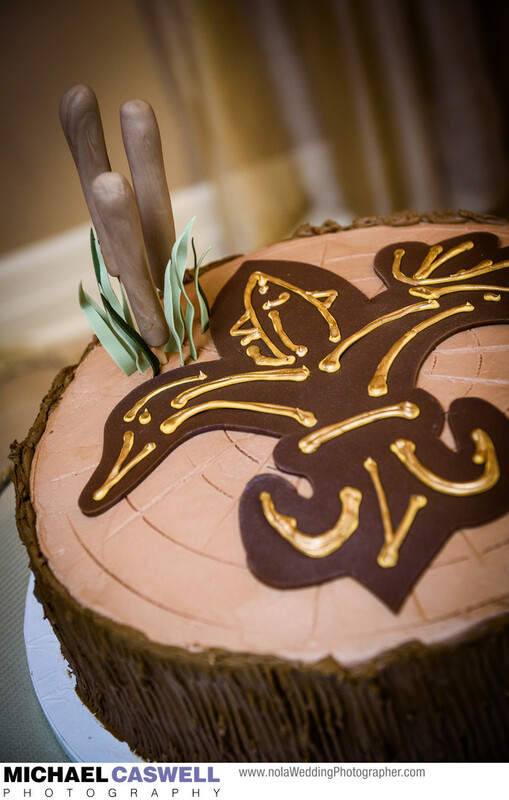 The popularity of fishing, hunting, and other outdoor activities in south Louisiana means we see a lot of cakes that represent this. Fishing is a very popular theme. 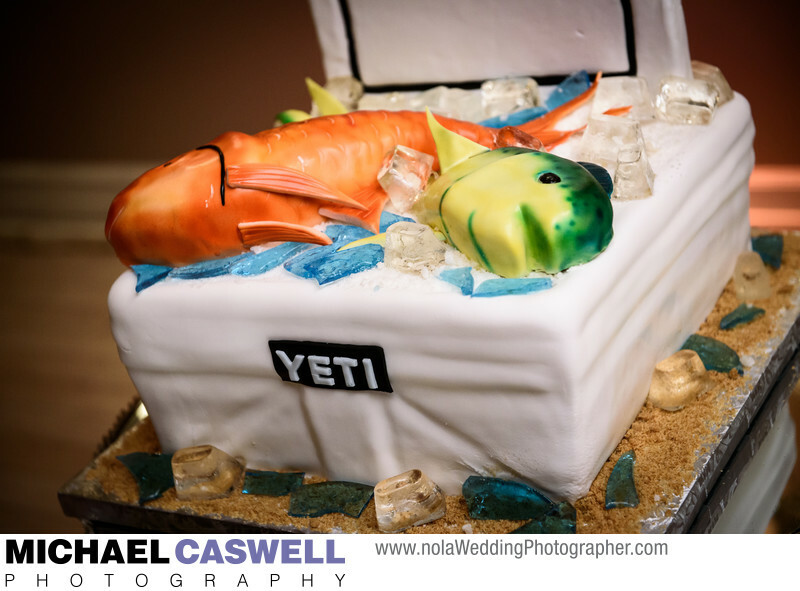 Here's an amazing rendition of the groom's catch on ice in his Yeti cooler, by Royal Cakery of New Orleans. And an amazing looking crab! 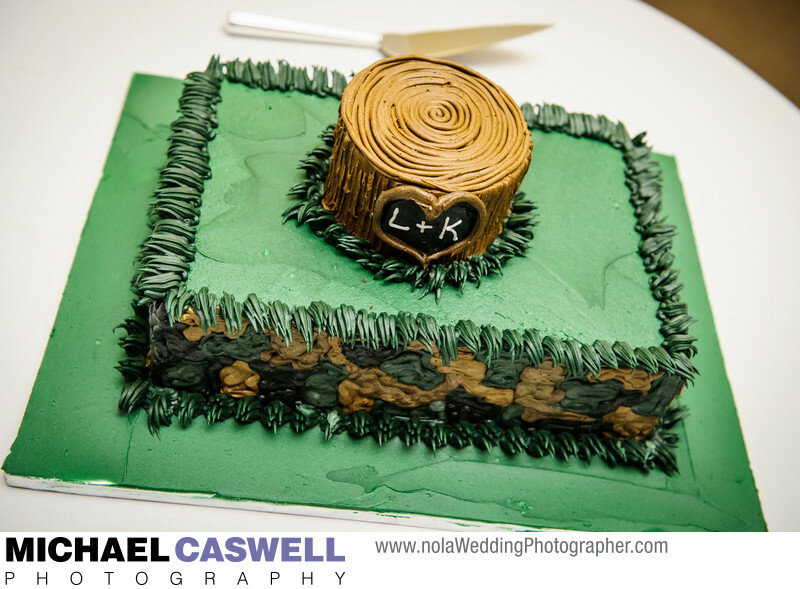 A romantic representation of the couple's initials carved into a tree stump in the Louisiana marsh. 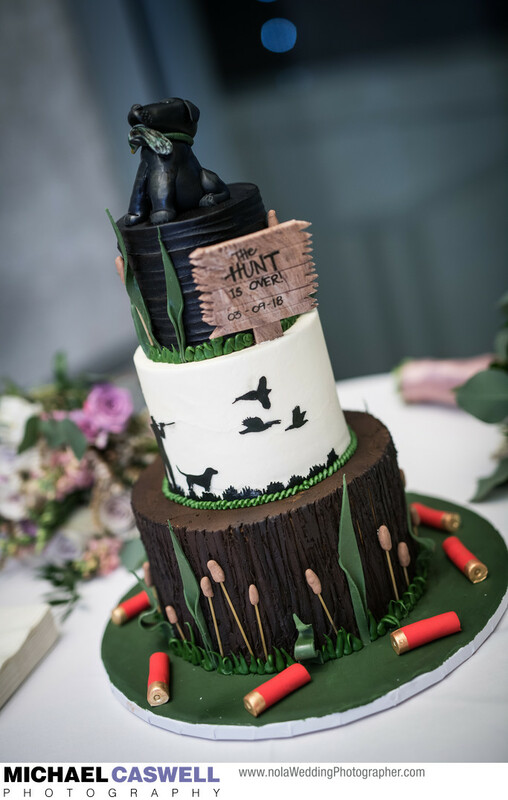 Here's a fantastic duck hunting cake from a Shaw Center wedding in Baton Rouge, complete with scattered shotgun shells and the groom's dog proudly perched on top of the cake with a duck in his mouth! 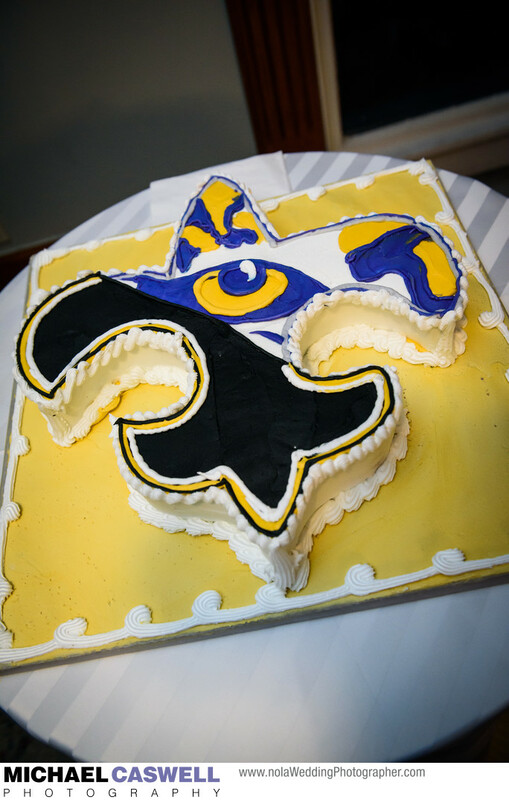 There's really no limit to how much imagination you can put into these cakes, and you'll find most bakeries are open to the challenge of just about anything you can think of, such as this fantastic blackjack table cake at Boudreaux's by Ambrosia Bakery in Baton Rouge. 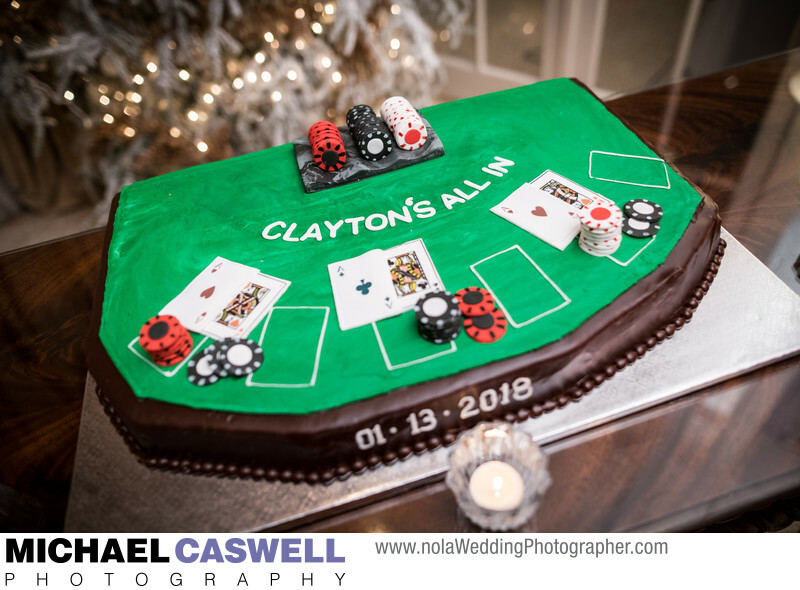 This groom's friends used to joke that he enjoyed the game so much, that if they ever couldn't find him, they knew he'd be at the blackjack table! A gorgeous Ferrari F430 engine. 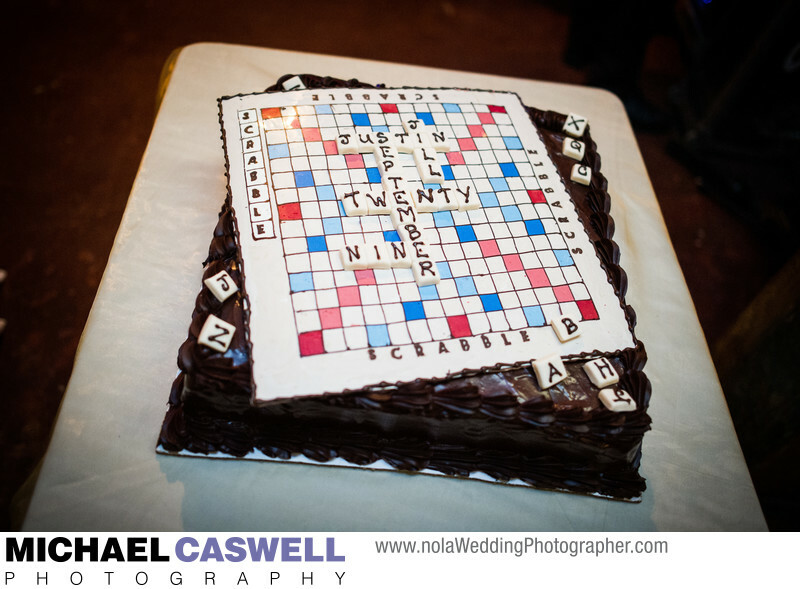 A scrabble board, with the couple's names and wedding date spelled out. 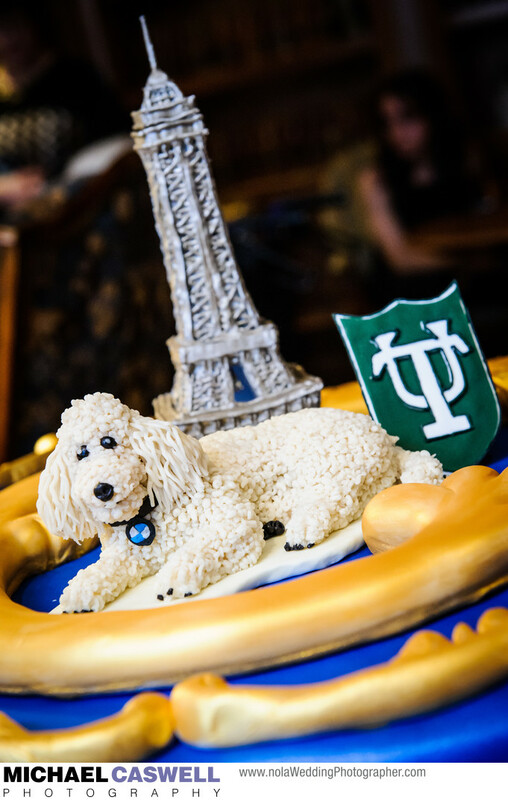 This cake at the Roosevelt Hotel's famous Blue Room is a mash-up of themes, representing a few of this groom's favorite things... the Eiffel Tower, since Paris is where he proposed to his wife, Tulane University where he graduated from law school, and the couple's beloved poodle, who is wearing a tag with a BMW insignia! 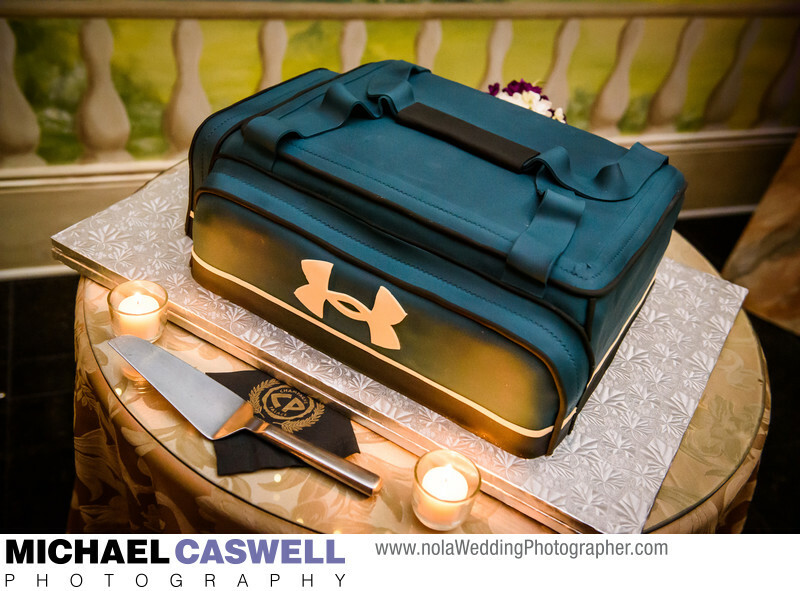 This groom is rarely seen without his Under Armor bag, so it was a natural choice for a cake. 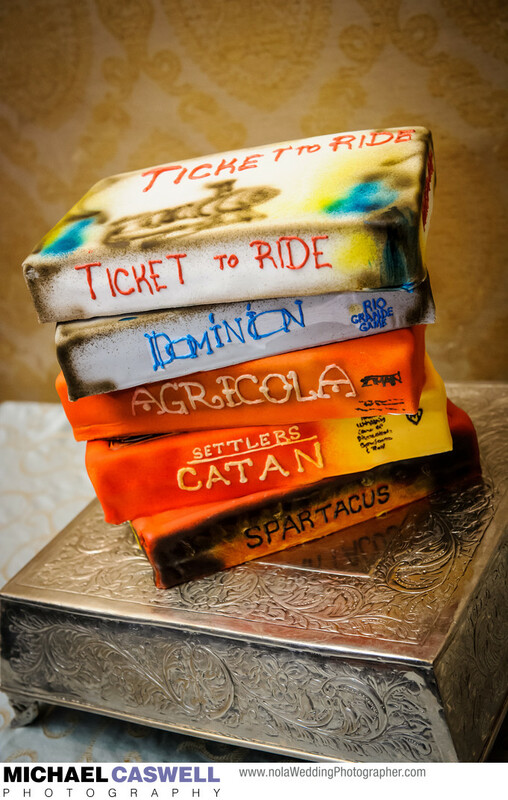 Here's a stack of the groom's favorite board games. 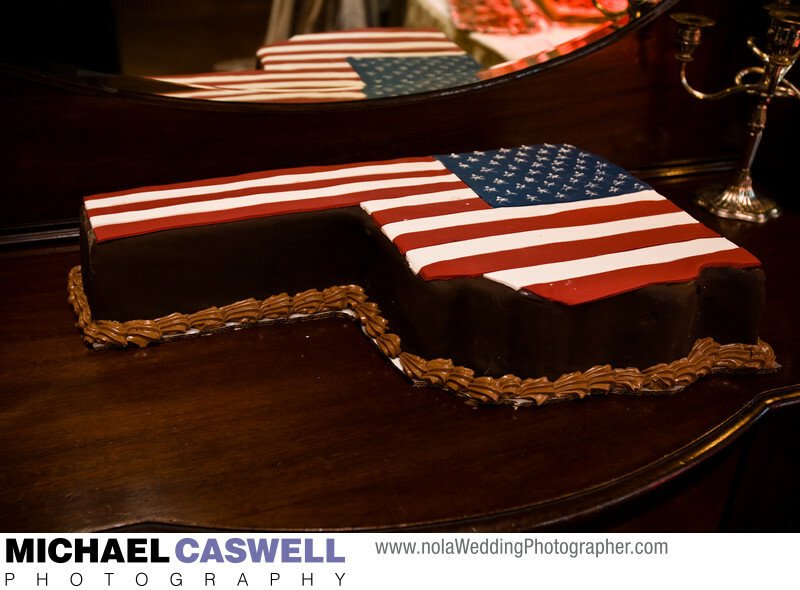 This was a really cool and unique idea for a groom's cake, and is one of my all-time favorites. 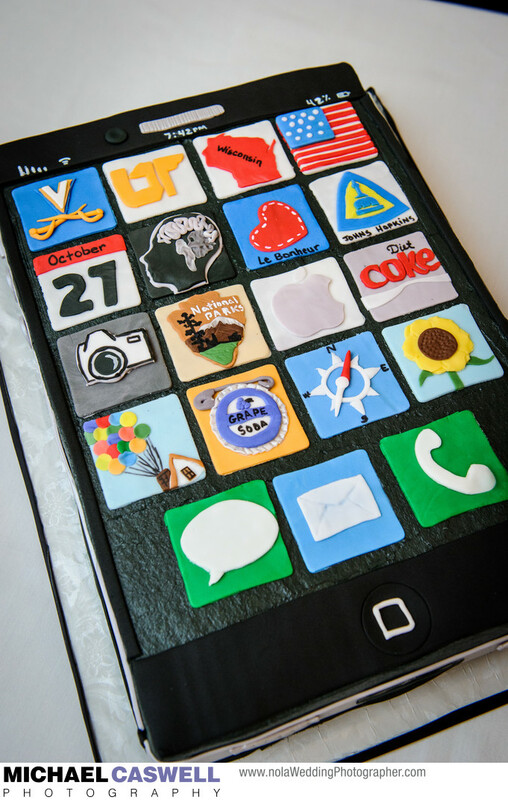 It's clearly an iPhone, but with most of the app icons representing various aspects of his life, interests, career, and other things that are important to him... he's an accomplished radiologist who loves Diet Coke and Apple products, is an avid photographer and world traveler, and his favorite movie is Disney/Pixar's Up! (it even earned two spaces on the cake... the well-known image of the house being lofted by balloons, as well as the grape soda bottle cap "Ellie badge" adjacent to it). And yes, October 27th was the wedding date! 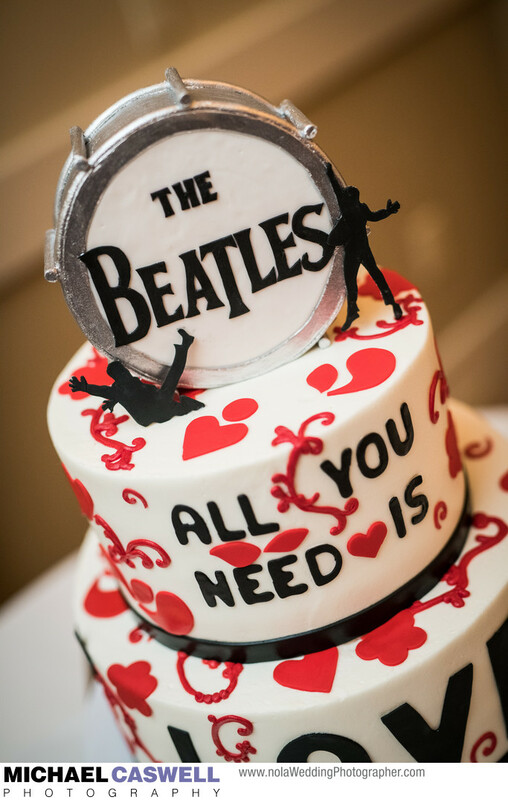 And to finish off this collection of fabulous groom's cakes, The Beatles, All You Need is Love, created by La Louisiane Bakery.